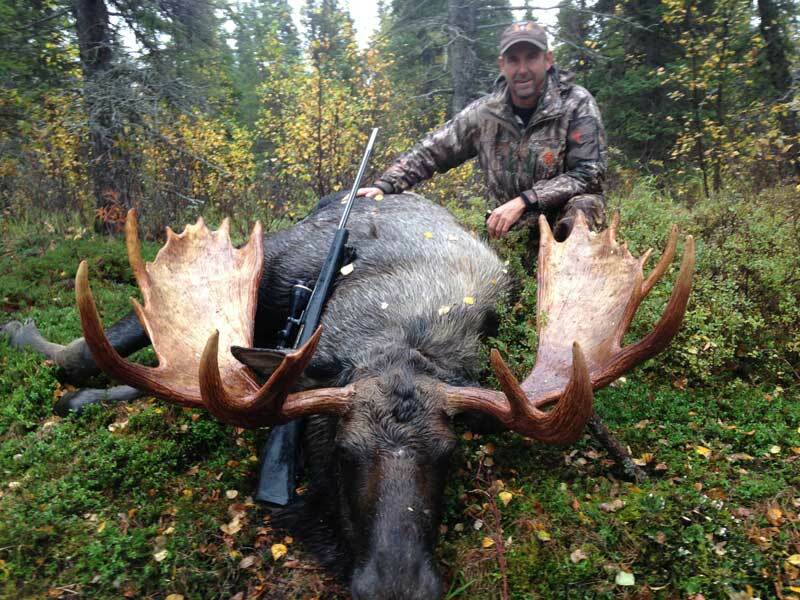 Trophy Moose Hunting Alaska with Alaska Elite Outfitters is a fully guided top quality Moose Hunting experience. Consequently, by taking only a few moose hunters into our vast area, we keep the Moose hunting quality high. 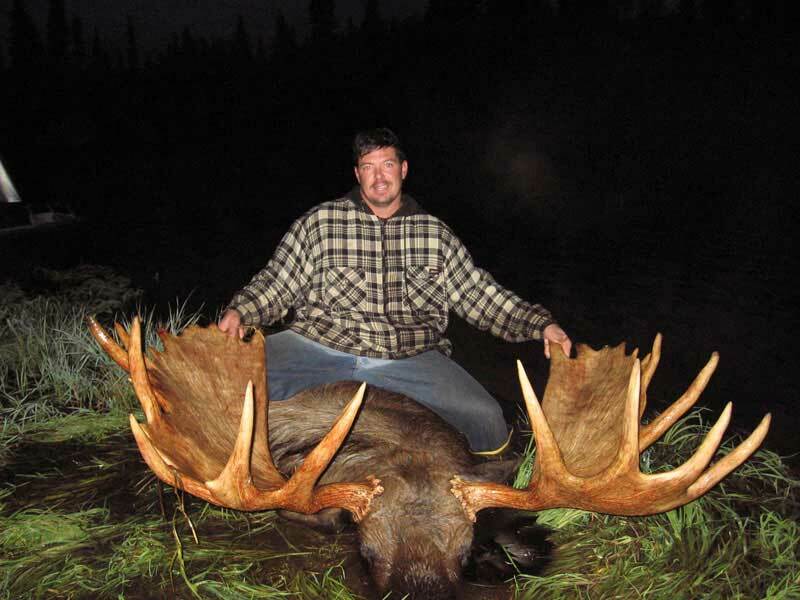 Alaska Elite Outfitters efficiently use jet boats for hunting the Trophy Bull Moose in our area. Thus traveling from calling area to calling area is comfortable and practical. Together with, Cow calling, bull grunts, and brush thrashing being the primary methods of getting big bulls within gun & bow range. Generally, backwaters, small rivers, and meadows are where big trophy bulls hangout. Thereby our ability to travel on jet boats and Zodiac’s make it possible to access these big Alaskan Bulls. Including the use of “Spike Camps, Alaska Elite Outfitters provides you the best opportunities to hunt these giant bulls. Especially early morning and late evening is essential to be out hunting. However, we return to base camp mid-day to resupply and dry out for the next night’s hunt. We moose hunt in early September (5th – 15th) during the pre-rut, at which time the bulls are very receptive to calling. We travel between call spots using a variety of calls and raking brush. Spot & Stalk methods are used in some circumstances when the terrain and brush are less dense. Understand these big bulls are not standing in the open like a photo in a magazine article. They’re here, and they’re big, but you have to work to get them. In conclusion, being patient is the most important thing, we can’t emphasize this enough. The trophy moose hunting in our particular area is unique in that it is a corridor permit hunt. There is a two-mile corridor along the upper Nushagak river, Mulchatna river and their tributaries receive a limited # of non-resident bull moose permit each year to restrict the number of bulls taken from this area. Having said this, we have never exceeded that # of licenses, and they have always been available for our hunters. Another reason our Alaskan trophy Moose Hunts have done so well in recent years and the average size is growing each year. Is Because we have experienced seven mild winters in a row, so it is allowing the old breeding bulls enough time to recoup after breeding season. Mild winter has not only increased those 64″-72″ bulls harvested but there is just more of them in our area! The mild winters help with getting the older bulls healthy again but also makes it much harder for wolves to get the moose caught in the deep snow which allows the overall population to grow. Trophy class bulls can be throughout Alaska, some of the largest come from the western portion of the state. Alaskan Moose occasionally produce trophy-size antlers when they are 6 or 7 years old, with the most massive antlers grown at approximately 10 to 12 years of age. In the wild, Moose rarely live for more than 16 years. Mature Alaskan Moose can weight anywhere from 1,400 – 1,600 lbs. In our area of Alaska, Moose can produce antlers that measure over 70″ wide and average over 60″. When calling trophy bulls in, the action is up close and intense most shots being between 20-60 yards. With almost 100% opportunity and 80% success rate on bulls over 60 inches, it is an excellent opportunity for a trophy bull. About 80% of our hunters bring a rifle, and the others prefer bow hunting Moose. Make sure to bring a good camera (preferably waterproof). If you can, bring a digital video camera, and we’ll get some great actions shots of you to take home! Click here to view rates & specials along with a list of suggested items to bring on your hunt.